You know that delightful scent of stepping into a brand new car? Or the feel of gazing at your Ford after its had a detailed car wash? What if we told you that you could keep that new car smell and look with just a few simple steps? Read on, Fordies! Make sure you are using a proper car soap, not regular soap. Get two buckets. Fill one with soapy water and the other will regular H20. 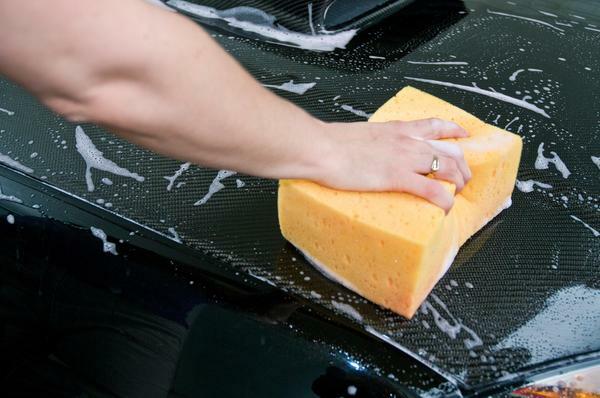 Start by dipping the sponge in soapy water and begin cleaning your car. Alternate to the regular water, removing any debris you may have collected from the car. Rinse and repeat over the entirety of your vehicle. Make sure to dry off your car after soaping. If you don’t, you might end up with unwanted spots. Tip: Try using a microfiber cloth. They work really well! When you move on to cleaning your wheels and tires, make sure to use a product that is water based and noncorrosive. Clean the glass last (Windex works great!) , as it will have dirt and grime collected from the previous steps. When cleaning the inside of the windshield, use a cleaner that’s ammonia free. Ammonia has the possibility of harming the interior of your car. Quick tip: To keep your mats clean, try using compressed air! Also try using this compressed air on the vents to keep your car smelling new. Throwing a dryer sheet under the seat will also keep your Ford smelling extra lovely. There you have it. Follow these steps to have the freshest, cleanest ride around. If you’re looking for something even snazzier than a clean car, try some Ford add-ons! Our detail manager has the hook-up and the 411 on updates. Need in house window tinting, a leveling kit or front and rear bumper replacements? Our accessory manager is your gal! Call 512-706-6204 and ask for Misty! Warning: Might make your friends jealous. Tell them your secret? Or don’t.